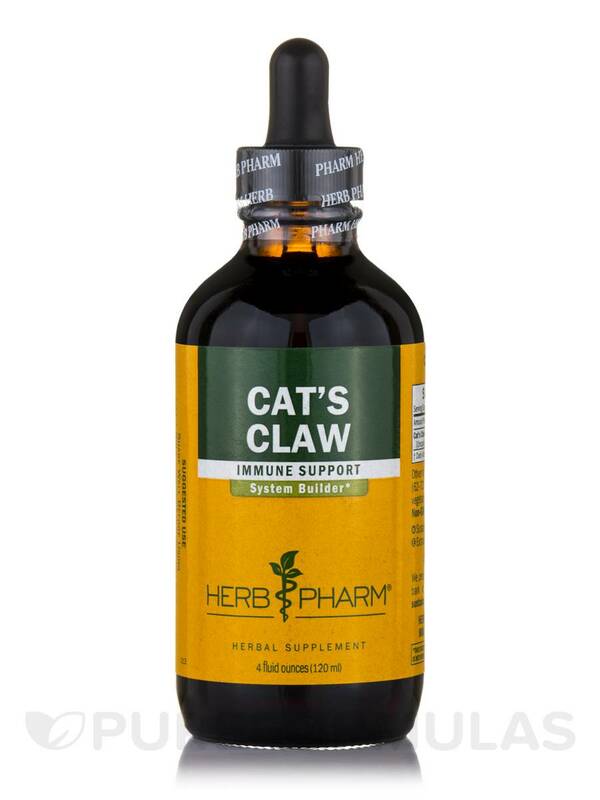 Cat’s Claw Extract by Herb Pharm is a liquid herbal supplement that may work to support the functioning of your immune system. Cat’s claw—which is also known as uncaria tomentosa or Uña De Gato—might work to stimulate immune function by providing alkaloids that have the potential to boost white blood cell levels; this is important because white blood cells are responsible for attacking viruses‚ fungi‚ and foreign bacteria that can cause you to feel sick. Moreover‚ Cat’s Claw Extract may help address certain symptoms associated with inflammation‚ such as mild joint pain or stiffness. Specifically‚ cat’s claw could potentially inhibit tumor necrosis factor (TNF)‚ which is a cytokine (molecule that sends messages between cells) that’s involved in your body’s inflammatory response. Finally‚ this supplement also has antioxidant properties. As a result‚ it may act to protect your cells from free radical damage. Each bottle of Herb Pharm’s Cat’s Claw Extract contains four fluid ounces of solution‚ which is made with the sustainably wildcrafted and hand-harvested inner bark of the uncaria tomentosa vines that grow in the Peruvian Amazon. Other Ingredients: Certified organic cane alcohol (62-72%)‚ distilled water‚ certified organic vegetable glycerin and certified organic vinegar. Add 1 full squeeze of the dropper bulb to 2 oz. of water or juice‚ 2 to 4 times per day. Best taken between meals. Seek expert medical advice before taking during pregnancy or if trying to become pregnant.